Church of St. Nicholas in Klёnnikah (or Blinnikov) – the Orthodox Church, located in the White City in the Basmanny area (str. Maroseyka, 5). The main altar – St. Nicholas, the chapels: Kazan; All Saints in the Russian Land; righteous Alexis elder of Moscow; Holy Martyr Sergius. In 1468, Ivan III built a “votive” Simeon Divnogortsa wooden church in gratitude for being a strong fire from the White City has not spread to the Kremlin. In 1748 after a fire was built the existing bell tower and rebuilt facade of the church, we note that the renewal of the Church in the same place in 1868 and 1894. In 1910 years, the church parish school has worked. At this time, the church priest’s well-known father Alexey Mechёv glorified among the saints of the Russian Orthodox Church. In the years 1914-1915 in the courtyard of the temple was built a small two-storey house for the clergy at the expense of the publisher Sytin – in gratitude for the permission given to him rector Father Alexei Mechev, to bring to the church yard box belonging Sytin multistory building (now – Maroseyka , №7 / 8). After father Alexei Mechёv death in 1923, his son Father Sergius Mechёv became a rector (and was later canonized by the Russian Orthodox Church). Repeated repairs badly distorted facade of the church. In 1929, Father Sergius was arrested and he died as a martyr. The church has been the advent of “commemorate” of Metropolitan Sergius. In 1931, the Church was closed on Annunciation and it was beheaded with the bell tower. At first it placed – warehouse, and later – the offices of the Central Committee of Komsomol. 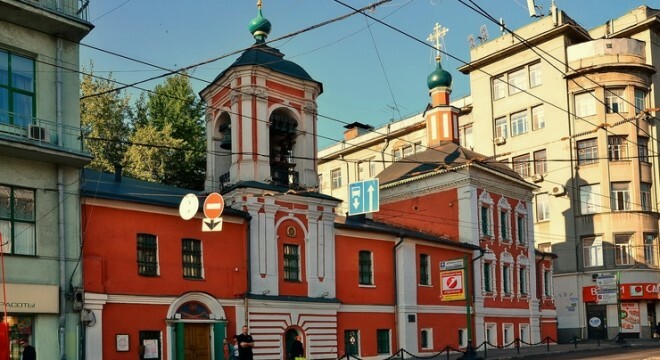 In December 1989, the temple was restored iconography, and July 18, 1990 the church was returned to the Russian Orthodox Church. There were restored heads, crosses and interior decoration. In 17 December 1990 was held lighting. The first abbot of the temple after the opening became the Father Alexander. In the present time, the church held regular worship.